HOA MTG NOTES: The April board meeting for the TPOA was held April 5, 2016 and there was a good turnout of interested property owners in attendance. Our President commented that he had not seen a “Citizens to Speak” form completely filled in by property owners for some time at one of their meetings. Topics of discussion included social and community events which are coming up, a treasurers summary, projects being completed around the park and a presentation about the clubhouse and the survey which was sent out for property owners to respond to showing their interest in improving the current clubhouse and provide feedback for the board. Projects being worked at the moment include an additional basketball court which will be completed by resurfacing one of the old tennis courts turning it into a basketball court. This will provide 2 courts for the many neighborhood children and their friends to be able to have access to more playing time on a court…one court was always full with kids waiting to play…so this addition allows more use and less waiting time. The pavilion is also getting a facelift with painting, stone columns to resurface our current metal supports and an update/upgrade of the look of the pavilion with the focus being on matching the new bathrooms finish. The septic system has been completed and the grass will be replanted once settling has finished in the area where the work was completed. CLUBHOUSE: The board presented results of a survey sent out to property owners on three different occasions. There were some voices in the audience expressing concern that they never got a survey and didn’t get to participate noting that the Spectrum e-blast system seems to work sometimes but not all the time. The presentation represented that there were 600 responses to the survey (from 3 send outs of it) and the statistical results of the survey were presented. The discussion included that the board was discussing building a new clubhouse from the ground rather than renovating up based on overall cost to renovate versus build new. The audience engaged with concerns that this was not what was conveyed in the survey which asked about what “improvements” you would like to see for the clubhouse area. There was a great deal of discussion and the board informed the audience that there will be meetings scheduled in the upcoming months specifically geared to discussing the clubhouse and it’s future, the costs of the upcoming project, the funding, etc. I CANNOT URGE YOU ENOUGH OF THE IMPORTANCE OF PARTICIPATING IN THIS VERY SIZABLE DECISION FOR OUR ASSESSMENT FUNDS AND OUR NEIGHBORHOOD. BE SURE TO PARTICIPATE IN ANY SURVEYS AND ANY MEETINGS THAT WILL BE COMING UP TO LEND YOUR VOICE AND YOUR INTEREST TO THE PROJECT!! There was also a neighborhood watch report, a report by the Timberwood Pets page and notice that Marilyn Litt, who has been one of the neighborhood champions to animals and their owners and getting them back together when they become separated, is leaving Timberwood and wanted to see if the board would authorize the purchase of a chip reader for someone who might be interested in taking over that job once she moves. The board took it under consideration. Citizens to be heard included a wide range of topics. Here is some of the discussion: 1) the lack of inclusion in the clubhouse survey noted above, 2) who monitors the park and the unsupervised children who are riding bikes across the golf courses for example or climbing fences, etc., 3) how ACC works and how long does it take to get an approval for a project, 4) a concern about removing one of the tennis courts in lieu of a 2nd basketball court and not providing better communication that this was what was going to happen during the closure of the tennis courts, 5) a discussion about rules for the pond and neighbors asking about kayaking and sail boating on same – which was answered by the notation that the lake isn’t set up for any type of boating and the recent expense of relining and refilling it would be impacted by people walking into the lake to launch their kayak/boat — due to the clay base and how it would be affected and that boating/swimming is not allowed. 6) There was discussion about the 2-4 home starts throughout the neighborhood which have been stopped and never restarted leaving unsightly framework, etc. This discussion indicated that work was being done to get these projects going and I note that one of the Slumber Pass sites has construction being restarted this past week. 7) A discussion was held about landscaping in the park and how we might improve the appearance of it. 8) There was a discussion about controlling access to the social/neighborhood events which have grown in size, attendance, and number to warrant looking into how to maintain a reasonable level of attendance, traffic control, safety for pedestrians walking to the events, etc. The board took that under consideration as well. UTILITY WORK – Have you noticed the barrels and the signs on Blanco indicating utility work is underway? Looks like Google and AT&T to name a few of the larger industry names in the telecommunications business are working on installing their fiber optics and other platforms out this way. Google is particularly interested in growth areas (I think we qualify for that out this way) and are laying the groundwork to be able to offer internet and VOIP options in the near future. Progress here it comes! Hope you are all enjoying your spring and ready to enjoy Music in the Park and other activities our neighborhood supports! It’s springtime as witnessed from the yellow dust that is now blanketing all our outside furniture and yards — oak pollen is everywhere! And what a great set of quick storms complete with hail, wind and rain today to usher in April! April Board meeting – There’s a TPOA Board of Directors regular meeting scheduled for Tuesday, April 5, 2016, 7 p.m. at our clubhouse. Some of the topics of discussion include the newly proposed renovation/rebuild of the clubhouse and the results of a survey of property owners recently taken. Plan to attend to learn more about upcoming plans and discussion underway about this large project and how your annual assessment dollars will be allocated to make it happen. Old Tennis Courts – The old tennis courts will be closed for the next 3-5 weeks as upgrades are completed to include resurfacing and the addition of a new basketball court. Chili cook-off – A chili cook-off along with day long activities for all residents including live music, food trucks, and activities for the kids, and more! Join your neighbors in the park on April 2, 2016 for the entertainment. Lifeguards are needed – Life guards needed for our neighborhood pool: Working hours are between 11:30 a.m. to 9:30 p.m., Tuesday through Sunday. Applicant must be at least 18 years old, and have lifeguard certification, please email contact@spectrumam.com. Please include your name and contact information. Pool season – The 2016 pool season begins on Friday, April 15! Pool passes are on sale and can be purchased in the park office, which is open from 4 p.m. to 7 p.m. Wednesday through Friday or at the Spectrum offices located at 17319 San Pedro, Suite 318, from 9am- 5pm. To purchase the pool membership this year, please bring your park entrance cards with you so they can be activated to open the pool entrance gate. For rates and more information, check the April issue of our neighborhood newsletter. Are we non-annexed from the City of San Antonio? Yes! We will be for a total of 26+ years from 2006 when the agreement was reached with the city. Being non-annexed means we don’t have any city services like SAPD, fire or EMS, but it also means we are not paying city taxes for services which the city was unable to provide us at the time of negotiation. Our neighborhood is so unique with bar ditches, winding streets, no sidewalks or curbs and no storm water drainage (we are all on septic) and that made annexation far less attractive than was originally thought. There was also considerable discussion about what the SAPD could or could not offer in the way of timely support to our neighborhood given our location near the northern edge of Bexar County. As a result, the negotiations resulted in our non-annexation. 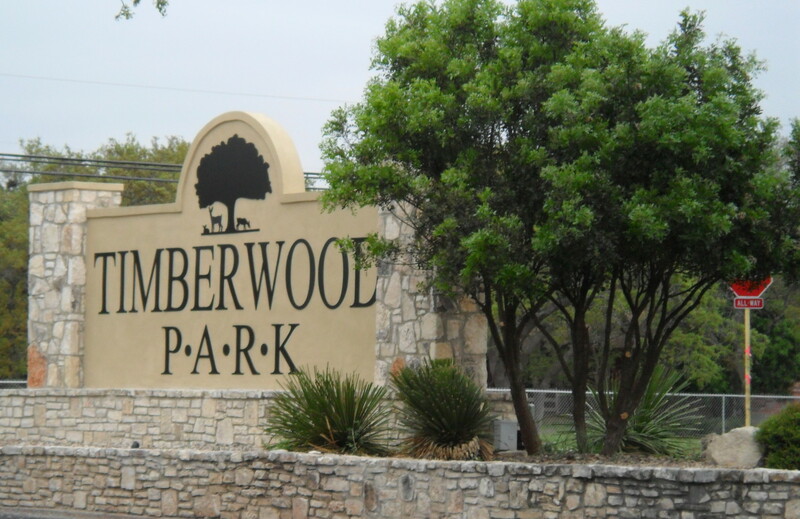 You can read more about the entire agreement on the web page www.timberwoodparksa.org under the Documents tab – click on the Non-annexation agreement. We do receive full law enforcement support from both the Bexar County Sheriff’s Office (BCSO) and the Precinct 3 Constables. They handle traffic control, calls by property owners for assistance, emergency calls, etc. Originally, while we worked turnover, we even had the BCSO use the old TPPOA office at the corner of Borgfeld and Timberline as a stop off and break spot which in turn provided us a great deal of additional timely coverage on a regular basis for the neighborhood. We are also part of ESD #3 (Emergency Service District #3) which handles our fire, EMS and other emergency calls. We are covered by the Bexar Bulverde Fire Department with substations on Borgfeld and on Bulverde Road. A new station is planned for the Overlook Parkway area (property already purchased) with ground breaking being discussed however the annexation efforts currently under discussion for much of the neighborhoods which surround us may be having an impact as to what will be happening to that site. Why don’t we have speed bumps or speed turtles on our streets? We researched these options on several occasions during the turnover process as well. In the case of speed bumps – because we don’t have curbs and sidewalks to attach them to and in the case of speed turtles – without curbs and sidewalks to keep drivers from avoiding them by driving into our bar ditches and onto private property we have been unable to install them. Our roads are public and maintained by the county and the county doesn’t install speed bumps or turtles for any of their maintained roads. Did we ever discuss gating the community? Yes, on several occasions while we were working on turnover and we even looked into its feasibility initially. The short answer is that we have approximately 40+ miles of public roadway that would need to be turned over to our HOA and managed and maintained by same if we did gate our community. Assessment fees would have to be adjusted to cover this very large expense — roadway maintenance, bar ditch maintenance and easement management in addition to our gates and the mechanisms that would control them. Did we ever look at hiring security for the neighborhood to help with crime management? Yes, again, while we were working on turnover details we did several studies and had several companies provide proposals to do the same. When we were a volunteer association with very limited funds at the time — about $25,000 a year to be exact to make what we were able to make happen work for the neighborhood —- it was impossible to even consider as the proposals brought us a figure that would have amounted to at least $100 per home increase annually to the assessment fund to fund a partial security force. And that was if the entire neighborhood participated. Did you all know how low our crime rate is compared to the rest of the greater San Antonio area? We have one of the lowest crime rates in our entire area and most of our crime is thankfully considered minor in nature compared to what some of our other neighborhoods face on a regular basis. I know that is of little solace to anyone who is impacted by a criminal act, and I don’t minimize being a victim for one minute. Join the crime watch group and keep up with what’s happening in the neighborhood. They do a great job keeping neighbors informed! New Indoor practice range – There is a relatively new indoor range which has gone into business on Hwy 46 just outside Bergheim and heading toward Boerne. Ballistic Therapy is a great place to relax and enjoy an afternoon or evening with a team of informed, professional staff who want you to enjoy your experience in an air conditioned, comfortable facility. They also teach firearms classes for License to Carry each Saturday by appointment, as well as offer private individual classes to help improve your skills or teach you how to correctly shoot a firearm you might not be familiar with. Practical advice and instruction are what I experienced in several instances for different training and course instruction. For more information, visit www.ballistictherapy.com . Great owners and staff…give them a try!